Technology is changing the school day for students, teachers, and parents. As the classroom shifts from a teacher-centered model–where the teacher was the sole holder and diffuser of knowledge–to a student-centered model–where students seek out knowledge more independently, with a teacher acting as a guide–it’s important to understand what technology is in the classroom, how it’s being used, and what key stakeholders think of the technological advances. For its 2016 Digital Education Survey, Deloitte analyzed more than 2,800 responses from demographically diverse teachers, parents, and students. Throughout its infographic, Deloitte used different icons to represent different respondent groups. Almost half of all classrooms use a digital device at least once a day. The most commonly used devices are laptops, desktops, and tablets, which more than half of teachers say they use at least once weekly. While devices are popular, teachers aren’t giving adoption an A+ quite yet. Rather, 40 percent of teachers say their school is “behind the curve” when it comes to tech adoption. This percentage is troubling given that 75 percent of teachers believe that digital learning content will replace printed textbooks within the next 10 years. How long a teacher has been in the profession also affects their view of ed tech. 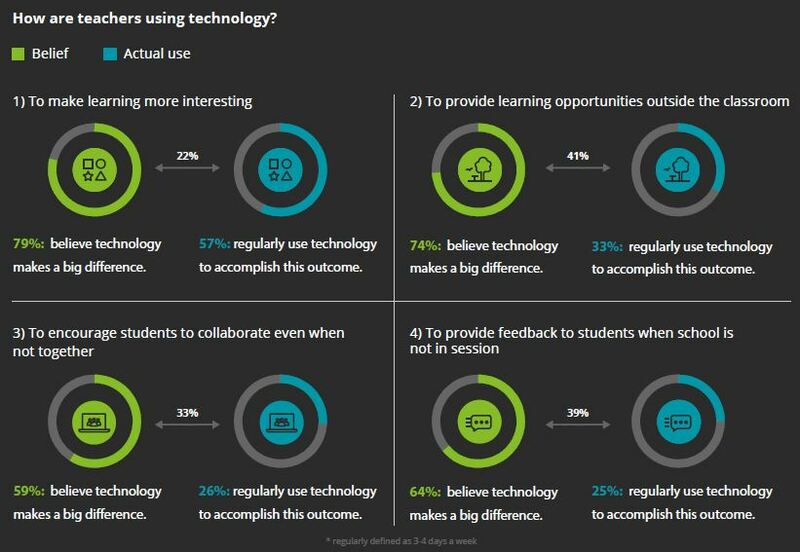 Deloitte found that 81 percent of teachers with 10 or fewer years experience believe ed tech at school makes a positive difference on learning. Grade level, and age of the student, also affects technology preferences. Deloitte also wanted to examine whether a teacher’s belief in a capability of digital education technology translated into how ed tech was actually used. Learning doesn’t start in kindergarten anymore. Deloitte found that 90 percent of kids use digital learning materials at home and that two-thirds start by the age of 5. Digital learning technologies allow parents and teachers to continue the learning process after the school day ends, and enables students to pursue their academic passions. More than 80 percent of parents and teachers are interested in having more at-home digital content to supplement in-class behavior. In-home content can help students who are lagging behind peers catch up, as well as gifted students who have already mastered the content. Additionally, 75 percent of students want to spend more time learning about school-related subjects when not in school. Whether it’s exploring dinosaurs in more depth or gaining a deeper understanding of the Civil War, digital education technologies let students become experts on subjects they care about. 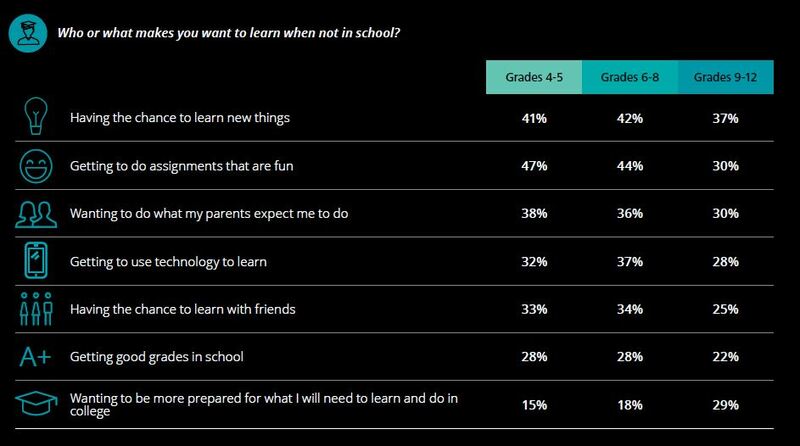 Deloitte also examined a student’s motivation to learn outside of school across various grades. Even outside of the classroom, a teacher’s judgment and opinion reigns supreme. Fifty percent of students who played educational games during the summer did so because it was recommended by their teachers. The report also found that 73 percent of parents trust their child’s teacher for advice on the best type of digital education materials for their child’s learning at home. For more on Deloitte’s 2016 Digital Education Survey, view the report landing page or press release.